Deaf dog: Spirit is a blue merle Australian Shepherd puppy who is doing great in obedience class, and just loves the snow. Due to unfortunate circumstances, he had to be sent to the Rainbow Bridge in September of 2001. He is sadly missed. 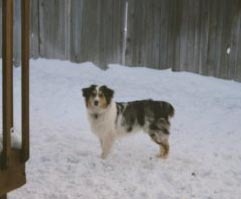 Other pets: Callie and Megan, two female Aussies. 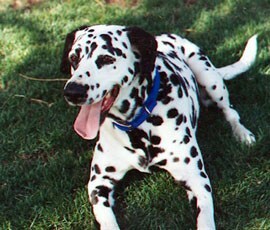 Deaf dog: Pebbles, a 15 year old Dalmatian. Pebbles left for the Bridge in the fall of 2000, and is deeply missed. Other pets: two fine felines. Deaf dog: Mia, an Australian Shepherd/Blue Heeler mix puppy. This beautiful, blue eyed, furry white pooch runs like the wind. She is named after Mia Hamm, the soccer player. Human companions: Kymberly E Ceres, her husband Russ, and her two sons, ages 3 and 6. Other pets: Dickens, an elderly cat. 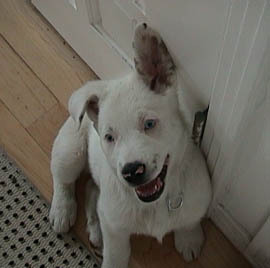 Deaf dog: Edison, or Eddie, is a sweet, mixed-breed puppy adopted from a local rescue. Eddie promises to be a very good member of the household. Other pets: a cat, two rabbits, a hedgehog, and a turtle. 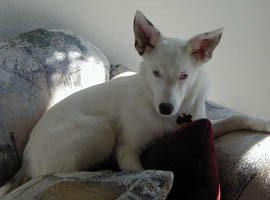 Deaf dog: Fantasia is now 2 years old, and has grown to be a great companion. Her unique personality is apparent to everyone who meets her. 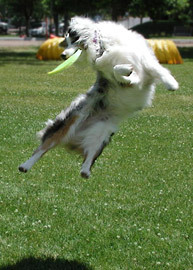 She has become very proficient with the frisbee! Deaf dogs: Stormy, a 9-year-old Great Dane. When his mom was teaching classes, he was the demo dog, he was just that good. Dufus, a two-year-old Great Dane who is a huge clown. Dufus has been in foster care with Colorado Great Dane Rescue for close to a year. Other pets: various foster and rescue Great Danes. Deaf dog: Cadence is a 10 month old congenitally deaf Dalmatian. Her family did not know that she was deaf when she came to live with them. Her family says "Cadence has fit into our family perfectly. She and our 2 year old daughter are partners in crime--I believe they were made for each other!! Cadence has a wonderful personality...always happy, and wags her whole body when she wags her tail. She brightens each day for me in her own special way." 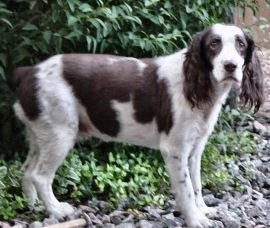 Deaf dog: Ladey Kadey, an English Springer Spaniel, passed on of natural causes February 21, 2004. "Kadey spent her earlier years hunting pheasants across Minnesota and Iowa. She joined me from Macon, Georgia as a little pup." Other pets: Sammy, 7 month old German Shepherd; Hexe, 15 year old cat; and Godzilla, 2 year old Guinea Pig. 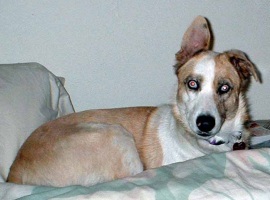 Deaf dog: Maggie is a 2yr old Australian Cattle Dog/Corgi mix. Her family says: "I consider Maggie a rescue as she came from a home where she was not wanted, lived outside in a yard and had a bad burn when I adopted her. She was a year old. She is most delightful!! She is happy and energetic and very cute. Has a clown-like personality and a way of posing that just makes me laugh. Her energy is amazing. I plan to get her certified as a therapy dog and would like to work with deaf children. She would love that!" Other pets: Dixie, 12 yr old boxer. Charley 3 yr old flat coated retriever mix. 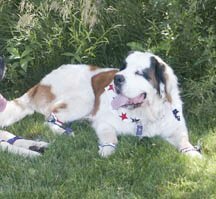 Deaf dog: Laya is a 5 year old St. Bernard who is deaf due to trauma. "Laya came into our home when she was 4. Since being rescued by Colorado Saint Bernard Rescue she has become a wonderful member of our family. She does public appearances and therapy work in her spare time. She is a wonderful friend and great dog." Deaf dog: Chief No Ears, is a 4 year old English Setter. "Mr. Chief was adopted from the Colorado Springs Pikes Peaks Humane Society. He was came in as a stray and the shelter did not know he was deaf. It took us about two days to really narrow it down. He has been the best dog! We taught him our own hand signals for sit, down, come, and stay. We are now working with a vibrating collar to help teach him come when we go to the dog park. 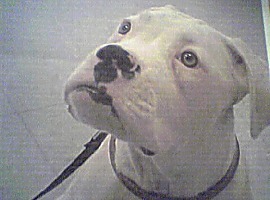 I'm so glad to see so many others who love animals enough to have a deaf dog!" Other pets: A leopard gecko, and seven rats. Deaf dog: Ittle One was born with cleft palate and fought very hard for her life. Sadly, my precious Ittle One has left us behind to be an angel somewhere. Her health was doing just fine, her cleft palate was operated on and we were adjusting to her deafness. She managed to get out of the yard and was hit by a car." Other pets: Ittle One's parents, Jade and Tyson. Deaf dog: Sophie is a 2 year old Dalmatian. "I was looking for a dog, and saw Sophie on DDEAF in the Urgent section. Her owners were moving back to Australia, could not take her with them, and she only had a week until she was going to be relinquished to a shelter (and, as we all know, likely an untimely demise). I was living in Chicago at the time, Sophie was in San Diego, but it didn't matter, I was in love! I flew out to San Diego and drove back to Chicago with her the next weekend. Sophie is a joy. Totally dysfunctional but with the self-confidence of a super-model. She is only about 37 lbs, has one blue eye and one brown, and is stone deaf, but is full of life, love, and has the quirkiest and most generous personality of any dog I have ever owned. She struts around on walks, knowing that despite her supposed short-comings, the world can't help but love her. Sophie is my first deaf dog, and other than commanding her with my hands instead of my voice, it was surprising to me how much she is like any other dog. She barks at strangers, chases rabbits, digs HOLES in my yard...UGH. Still, I can't imagine her not around. She's the best. " Human companions: Tiffany Pereda, Daria, 6 and Vitaly, 4. Other pets: Two hearing cats. Deaf dog: Teddy is a 1-1/2 year old Australian Shepherd mix. "Teddy came to me from a family in Ohio who could no longer care for him. He is a wonderful dog, extremely intelligent and picks up new signs quickly. Teddy also loves to play and has been known to "throw" the frisbee for himself." 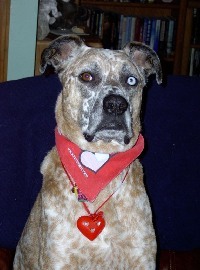 Deaf dog: Quantum is a 6 year old Australian Shepherd mix. "Quantum or Q (easier to sign) has been a great addition to our home. We adopted him from the humane society in Denver a couple of years ago. We never had a deaf dog before so it was a real challenge for Q and myself. Q loves walks in the park and riding in the car. He is a very high energy dog, so I'm looking into agility training and other activities to keep him occupied." Other pets: 2 birds, Woostock and Sundance, and fish. Deaf dog: Allie is a 3 year old Boxer. "Allie is a wonderful addition to our family. I first fell in love with Allie when I was asked to ID a Boxer at the local shelter. I visited with her at the shelter and the moment I laid eyes on her my heart melted, not knowing at the time that she was bilaterally deaf. Once Allie was pulled from the shelter by the rescue group I volunteer for, she came to live with us for a "little" time as a foster. Once she was in the house and I saw how smart she was I could not let her go. Allie originally came to us in June of 2003 and we officially adopted her in September. I would love to share her story with the world so that people can realize that deaf should not be a death sentence. When you tell people you have a deaf dog they always feel bad for them, but I always tell them that she doesn't have any idea that she is different. In my heart she is very normal and actually "listens" much better than my hearing dogs." Deaf dog: Lucy is a 4 month old French Bulldog. "Lucy is a beautiful and curious dog. She came from Budapest." Other pets: Pebbles and Paris, Pugs. Deaf dog: Bully is a 5 month old Boxer. 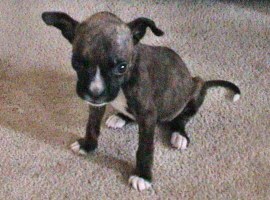 "We had adopted our past 2 boxers as adults and after a heartbreaking passing of the female, we decided to get a puppy. We purchased him from a breeder who did not tell us that he was deaf. He is white so I guess we should have known. We thought of returning him until we heard of the life he might have with adoption, etc. I couldn't let him go. It was the best decision we ever made. Bully is amazing! He is the smartest dog that my husband or I have ever owned. He watches everything we do. He was potty trained within 2 weeks and knows all of the main commands. He is such a light in our lives. Something so innocent and loving. We bought a leash where we attach him to our male adult when we go to the park and there have been no problems. We never leave him off the leash but are looking forward to training with the vibrate collar when he is older so we can continue to enjoy our outdoor activites. If you have the patience then I recommend adopting a deaf dog. I swear he can hear us come home. He also seems to know EXACTLY when I wake up for a potty break in the middle of the night...he needs one too! He is such a gift. A big bully that can't hear my adult male give the warning signs that he is being annoyed so he presses on annoying him and a big bully with a heart that is just as big. Gifts like him and other deaf dogs can't be ignored." Other pets: Jake, and adult male Boxer.